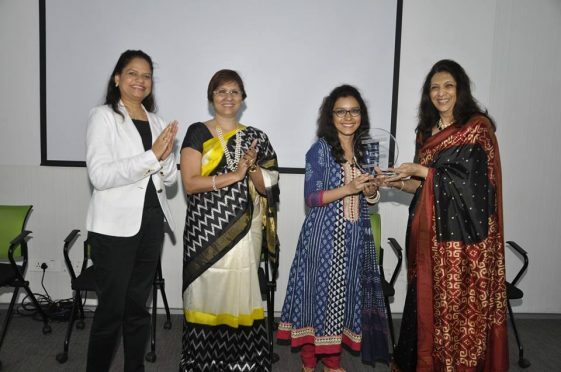 About the Author: Kimberly Rowe (second from right), an English literature graduate from St. Xavier’s College, Mumbai, presents a gripping account of her fellowship experience and how she worked hard to make a difference in the lives of marginalized community women. I applied for the YES FOUNDATION “Media for Social Change Fellowship” with the hope of spending a meaningful summer vacation before pursuing my post graduation in Advertising, Public Relations, and Integrated Marketing Communications. I filled a detailed online application form and gave the telephonic interview. After one week, I received the fellowship letter from them. My happiness knew no bounds, and I literally dragged my parents from the hall to view the letter! It was a proud feeling to know that I was one of 45 fellows hand-picked from 920+ applicants pan-India. Although I had changed 4 cities and learned to meet and interact with new people, I was a little bit nervous, and a whole lot excited about the 1-week induction training. With the inclusive atmosphere at YES FOUNDATION, I came to know most of the fellows within a day or two. The induction training was an all-encompassing umbrella of the media field and social development sector. I learned how to use social media for nonprofit organisations effectively, how to develop creative content, and how to use photographs and films as a medium of communication. More importantly, I learned all this and much more through interactions with the industry stalwarts. Apart from the interactive and informative sessions by media professionals, team building activities and self-introspection & personality development workshops were also conducted regularly. I not only learned how to build the brand of a Non-Profit but also how to create a brand ‘YOU’! On completion of the 1-week induction training, I was placed with CORO for Literacy, Mumbai – a nonprofit organization which works for the empowerment of marginalized community women, adopting the rights-based development approach. I was given the opportunity to develop communication material and launch social media channels for CORO’s Mumbai-based women empowerment program, Mahila Mandal Federation. Being my first time in the development sector, I was skeptical about my acceptance in the Non-Profit. It took just one day to change my perception. The members were welcoming; they shared their resources and interacted with me. I truly felt at home. Thereafter, my journey was an upward trajectory. Through my interactions, I learned about the origin of the organisation and its journey to empowering women in communities till date. I was surprised to know that CORO is a grassroots organization where members belong to the communities that they work for. I won the hearts of not only the members working in the office but also the members of the communities. I began visiting communities and capturing images and videos of women with their consent. It was an eye-opening experience to listen to real-life stories of domestic violence from empowered women. Soon, they came to recognize me and baptized me with many pet names like Heera (diamond). They would give me advice about what to wear and what to eat – I had many ‘mothers’! Within 2 weeks of launching their Facebook, Twitter, and YouTube channels, Mahila Mandal Federation was presented opportunities galore. We achieved 200+ likes within a week. Our community women received employment opportunities from Birla Sun Life Insurance. We received support from Majlis Law and they conducted sessions to educate women about their legal rights and remedies. We also received multi-channel support from a mainstream blogger. That is the power of Media for Social Change. Midway through my successful work at Mahila Mandal Federation, CORO decided to do a make over of their social media and website development portfolios. I was ecstatic to know that I could do more for them. I had never developed a website, but I am glad to say I have mastered it now. Thereon, I would spend half my day at CORO’s office and the other half at Mahila Mandal Federation’s office. I learned to maintain a balance between both portfolios. Although I was successful, I faced my share of ups and downs. The community members were comparatively less familiar with the use of social media. However, their openness in asking questions and willingness to learn enabled me to conduct workshops for them to learn basics of social media, photography, and website development. With knowledge of only English and Hindi, I also faced a language barrier. My imperfect knowledge of Marathi resulted in a communication barrier during field visits. To overcome it, I decided to restrain myself from requesting that conversations be carried out other than in Marathi. I learned that, indeed, where there is a will, there is a way. Perhaps my biggest challenge occurred during the last week of the fellowship. As a part of my nonprofit’s social media campaign, I took the initiative to choreograph a flash mob to be performed at Chembur Railway Station to generate awareness about women empowerment. Unfortunately, I met with a knee injury. I was advised by my doctor not to walk, and definitely not to dance, because any pressure on the joint could lead to permanent damage. It was the first time the women in the communities were performing a flash mob, and I had given them hope of a large-scale performance, never thought of before. I decided not to give up, and today, I am proud to say that with their undying care, commitment, and constant support, we managed to perform successfully. YES FOUNDATION Media for Social Fellowship is only the beginning of my journey. This fellowship has given me tremendous exposure to the development sector and the field of media. The access to mentors and fellows made it a great learning experience, and I have gained not only theoretical knowledge but also practical experience. The certificate and special award given to me by YES FOUNDATION belongs as much to everyone at CORO for Literacy as it does to me! Editor’s Note – Here are some NGO internships for you to have an internship experience as cherishable as Kimberly’s. I definitely will, thank you Nishita!